Texas A&M International University students and alumni are invited to take part in Spirit Week, a series of events celebrating student life and school pride Monday-Saturday Feb. 11-16. 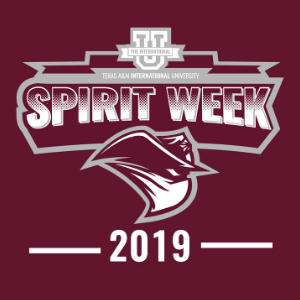 During Spirit Week, alumni will have an opportunity to connect with their alma mater and students have a chance to vote for Mr. and Ms. TAMIU. The week-long series of events will have something for everyone, including a tailgate party, a dunking booth, TAMIU basketball and softball games, a spirited pep rally and a tuition giveaway contest. Most Spirit Week events are free and open to the public. Admission to basketball games is free for TAMIU students, staff, faculty, and children 18 and under. General admission is $5. Admission to the softball game is free and open to the public. Monday, Feb. 11– “Do-Nut Skip Maroon Monday”: 12:40 p.m., Student Center Patio; “Singing the Alma Mater and Fight Song”: 12 p.m., Lamar Bruni Vergara Memorial Garden; “Meet the Dustdevils”: 12 – 1:30 p.m., Student Center Rotunda. Tuesday, Feb. 12– “Shopping Cart Parade”: 12 p.m., Student Center Rotunda. Wednesday, Feb. 13– “Ride With The University”: 11 a.m. – 2 p.m., campus-wide; “TAMIU Softball vs. Texas A&M Kingsville”: 12 p.m., Jorge Haynes Baseball Field; “Pep Rally”: 8 p.m., Kinesiology-Convocation Building (KCB). Thursday, Feb. 14– “University Tailgate”: 4 p.m., KCB Green; “Women’s Basketball vs. Oklahoma Christian University”: 5:30 p.m., KCB; “Men’s Basketball vs. Oklahoma Christian University”: 7:30 p.m., KCB; “Mr. and Ms. TAMIU Coronation”: after the Men’s Basketball game, KCB. Friday, Feb. 15– “Dunking Booth – benefiting the Make-A-Wish Foundation”: 3 p.m., KCB. Saturday, Feb. 16– “Women’s Basketball vs. Newman University”: 1 p.m., KCB; “Men’s Basketball vs. Newman University”: 3 p.m., KCB; and Tuition Giveaway, after the Men’s Basketball game, KCB. For more information, contact the Office of Student Orientation, Leadership and Engagement at 326.2280, email sole@tamiu.edu or visit offices in Student Center 224C.